I married my love on the 6 January. Twelfth Night. It was a raucous, happy affair. But we celebrated our wedding with two wedding cakes. Because we couldn’t decide on one. I wanted a plain elegant marzipan white icing fruitcake on which we would put fresh flowers on the day. Jacques, showing an intense dislike for both fruitcake and marzipan, insisted on getting married with a granadilla cake, his favourite : the type with two layers and frosting in between and messily slapped on top. The type you get at church bazaars and aunties’ house. Now I like granadilla cake, my aunty Margie made an excellent one, but I certainly didn’t want that to be my wedding cake, not at our wedding. Not accompanying the live jazz band and gin and lime sorbets. My mom suggested a compromise. His and Her cakes. And so it was that on the night, my cake looked beautiful displayed on the cake stand, a perfect white square, no frills, covered only in fresh full blown roses. Jacques’s cake, on the other hand, made a grand entrance, stealing the show. My mom had bought no less that 17 of those kitschy-cool bride and groom cake toppers and placed them all on the cake along with a handful of sparklers that set the night alight. And most people ate the granadilla version. Including me. I think my cake went home almost untouched and my family ate fruitcake for a year. But it is the granadilla cake we most remember. The flavour Jacques insisted on. Before Jacques, I never much cared for granadillas. As I child the closest I would come to them was eating the granadilla lollies, sold at corner cafes and on beaches in the summer, but even then, I, disapprovingly picked out the tiny black seeds. Older, I grew to like their other name Passion Fruit, mistakenly thinking it to be of sensual origin rather the spiritual one it in fact is. And I have always thought their flowers to be incredibly beautiful. I once visited friends in the Italian Lake District and their garden wall was covered in a creeper laden with blooming passion fruit flowers. I spent a lot of time admiring the intricate floral patterns and delicate markings while contemplating the lost-cause-love who had accompanied me on the trip. Perhaps the granadilla, mysterious in its more exotic setting, was a sign of things to come... A man I would love with all my heart, who I would thank God for, and who would make me love granadillas. Granadillas also feature strongly in the lives of my parents, who have been married for 43 years. My mom tells me that when she and my dad were courting, she would seduce him with desert of granadilla pulp folded into thick double cream. These days, she makes a less luscious version for them, using low fat Bulgarian yoghurt instead. A case of, cholesterolly speaking, the spirit being willing, but the flesh being weak. My mother-in-law gave me a recipe for the most divinely decadent use of granadilla. One part fresh granadilla pulp, one can of condensed milk and a tub of thick cream are all folded in together and frozen. The granadilla reminds me of My Gratitudes. There are so many seeds it’s almost impossible to count them. Now as I eat granadillas, each seed symbolizes a blessing. 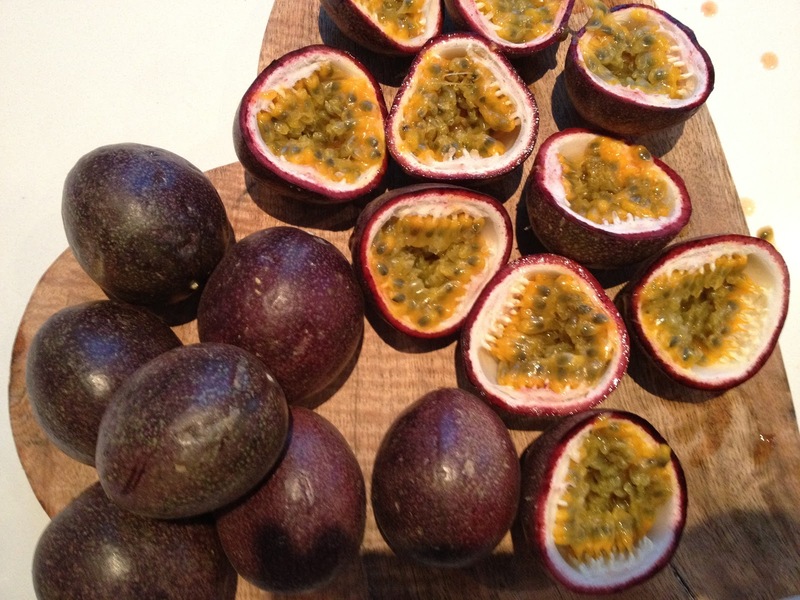 The granadilla has, for me, become a meditative fruit. And so while I eat my morning yogurt with the pulp and a smidgen of honey, I eat the seeds and count my blessings. That way I eat mindfully. So that food does not become my escape, but rather becomes my comfort. And, sometimes, I bite into the seeds. To remind myself. To be sure. My parents have now been married for 45 years. My mom is still battling her cancer - bravely and stylishly. She is determined that she will live so that she may one day teach our child to dance. We are still battling to become a family. Bravely but not always stylishly. Yet we know, with absolute certainty, that our baby will find his or her way to us. Eventually. Such a beautiful piece on passion fruit and life! I'll eat it with more thoughtfulness from now on. 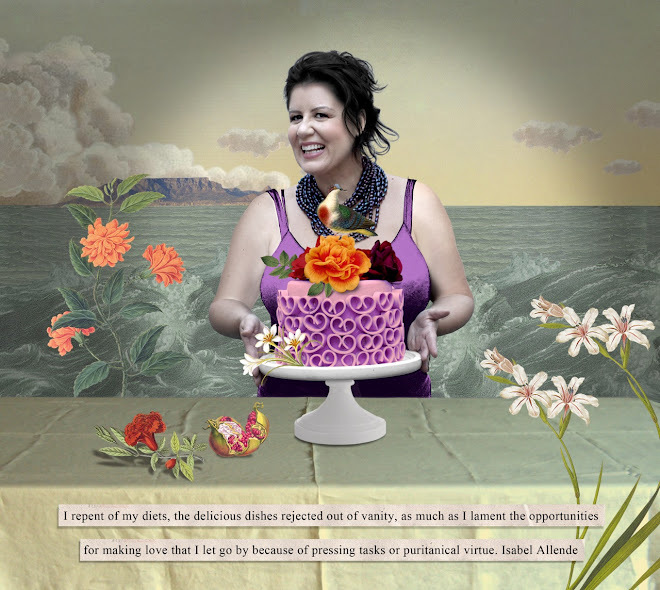 Could you please post the recipe for your passion fruit wedding cake? It sounds so delicious!